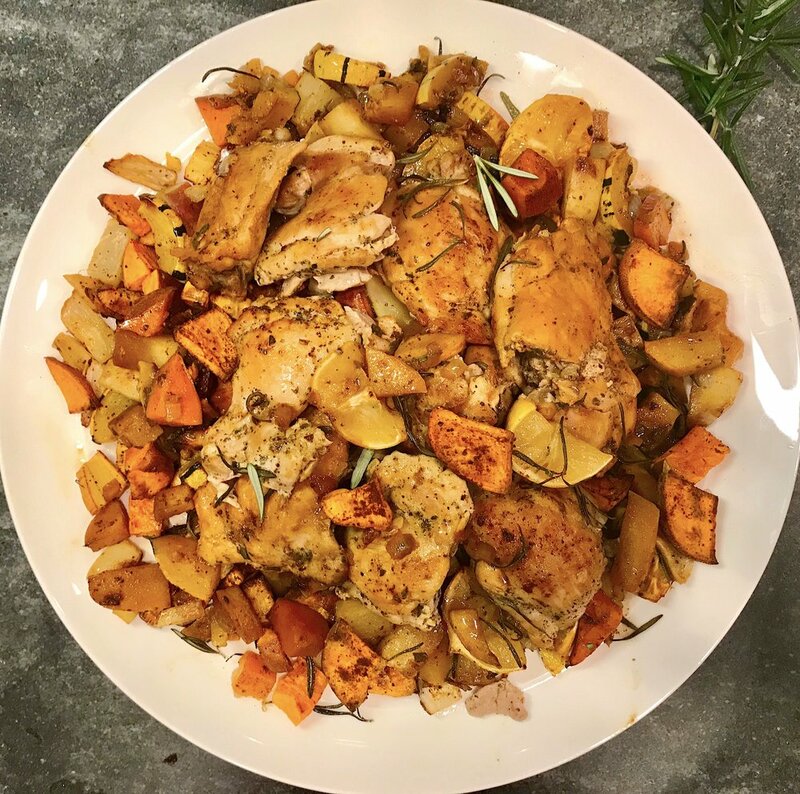 This is a delicious chicken recipe that your whole family will love! It’s extremely satisfying, packed with healthy ingredients and easy to make. It’s also the perfect dish to impress your friends if you’re having them for dinner or entertaining during the holiday season! Combine chopped rosemary, oregano, red pepper flakes, garlic, juice of 1 lemon, and 2 tablespoons of olive oil in a bowl. Season chicken with salt and pepper and then add chicken to the spice mixture. Rub to coat evenly and set aside. Toss root vegetables (squash, sweet potato, parsnip and turnip) with 2 tablespoons of oil and spread on baking sheet. Roast in oven until golden brown, about 40 minutes, tossing halfway through. Heat remaining tablespoon of oil in an oven safe pan or cast iron skillet over medium heat. Add the onion and mushrooms, cook for 5-7 minutes. Remove from skillet. Place chicken thighs in the skillet and brown on each side, about 2-3 minutes. Add the onions and mushrooms back into the skillet with the chicken along with chicken broth, fresh rosemary leaves and cut lemons. Place skillet in the oven and cook for 20 minutes or until the chicken has reached 165 degrees. Plate roasted vegetables from oven and place chicken mixture on top. Squeeze some lemon over everything and enjoy!